Coach White stomped and shouted his orders. Hayes, Florida’s heroic senior, stood helplessly at the bench. . . not flinching at the sound of his number being called. His teammates on the floor echoed the call . . . 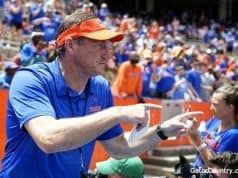 But Hayes was frozen, perhaps wondering if he was watching the final two minutes of a stellar career – one that transformed him into a leader, both statistically and mentally. Through 37 minutes, 58 seconds – this game was no different. Hayes, dubbed “Spidey”, was all over the court – tallying 16 points, 3 blocks, countless ‘altered shots’ and those game-winning hustle plays that just don’t show-up in the stat books. And during the moments Hayes took an infrequent breather – he led. “I was trying to remind the team it was far from over. We had to stay locked in,” Hayes said of his efforts to curb a rapidly unraveling game . . . season . . . career. But now it wasn’t far from over, and Hayes not only couldn’t be “locked in” – he couldn’t be in at all. With 2:02 remaining Spidey fouled out, walked to the bench and gave a fleeting hug to his coach. His team clung to two-point margin. As one heroic #13 exited, a new one entered. And a bold entry to say the least. “We ran a little bit of 13 at ‘em, which is a zone,” Jalen Hudson revealed. “It kinda disrupted them . . . they were trying to shoot it really fast”. 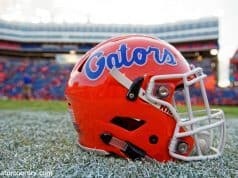 “Thirteen”, what Florida named its 1-3-1 zone defense, was more than “kinda” disruptive. It was devastating. So much so it had fans wondering, ‘why didn’t we do this sooner?’. But for every easy question, there is an easy answer. 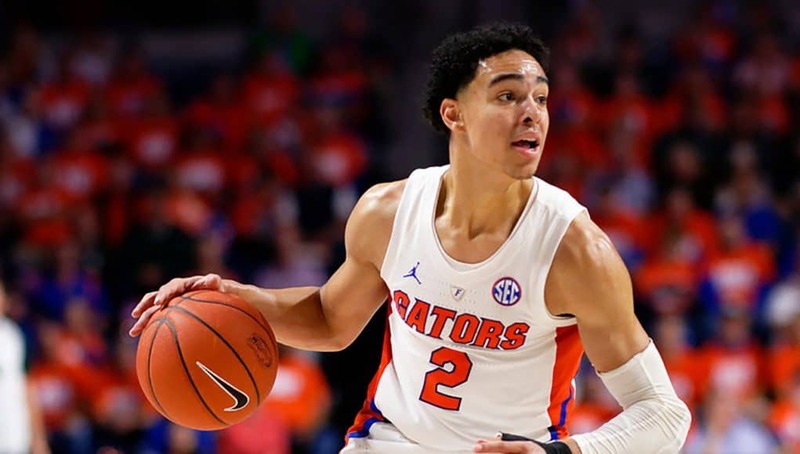 . .
An Andrew Nembhard layup was the score Florida needed – nudging a two-point margin to four, but more importantly, allowing for the defensive change. The Wolfpack was befuddled, and as Florida pushed its zone out high . . . tick, tick, tick. It was twenty nine ‘ticks’ . . . to be exact. . . and several passes, before Cody Martin launched a late, desperate and errant three-pointer. Basset snared the rebound and dunked on the other end of the court. 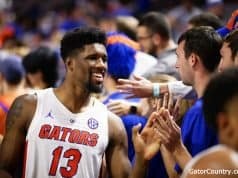 A previously razor-thin margin, and what seemed like an eternity of remaining game time shifted back in Florida’s favor. Tick. . . .tick. . . tick . . .
Nevada’s coach Eric Musselman inexplicably watched as his team passed . . . and saw time pass. ‘Thriteen’ stymied his senior-laden squad, forcing another 18 ‘ticks’ before yet another miss. Kevaughn Allen and Keyontae Johnson free throws pushed Florida’s figure to 70. Nevada remained stuck at 61 . . . a figure it sat at for the final 2:02. Tick . . . tick . . . tick . .
Kavarrius Hayes now wore his well-known smile and shared far less-fleeting hugs. Soon he’d walk off the court . . . arm draped over his coach’s shoulder . . . victorious! Thirteen had won another game! And the 1-3-1 wasn’t bad either.